Our books are special; they are only complete when personalised. Select a book from our catalogue (click on the book cover). You can immediately browse it, but to edit it you must register with this site. Change it to your requirements. We will save a draft copy so you can return and work on it for as long as you need. When you are satisfied that it is finished, we send it to Lulu.com for printing and binding. Lulu.com will take your payment and delivery details. Your finished books will be posted to you. For authors: If you would like us to publish your personalisable book, please contact us. 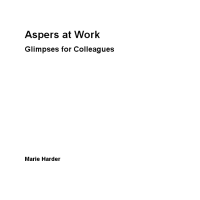 What small adjustments could your workplace make to help a colleague with Aspergers to really reach their potential? Aspergers is a 'mild' form of autism, but most people don't have much experience with what that involves. This little book uses simple examples to convey a lot of useful information about this emerging dimension of diversity in our society. It is a delightful introduction to a subject that usually evades simple crystallisation and communication.